Our principal objective is to support Giant Panda protection project and offer an opportunity to experience panda caring for Giant Panda lovers. Anyone who is interested in panda and love panda is welcomed to join this activity. You will go to Dujiangyan Panda Park to take care of and interact with giant pandas, learn about their daily life and food habits, make food and feed pandas… and you also have chance to hug panda here. 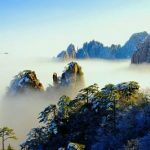 A panda volunteering will be an amazing experience for you China trip. 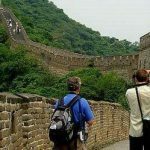 Paid directly to Intochinatravel to secure your booking. 1. Entrance ticket to Dujiangyan Panda Base. 2. Panda keeper lunch in the panda base. 5. The Panda Keeper Program fee in USD may change slightly according to the exchange rate. 1. 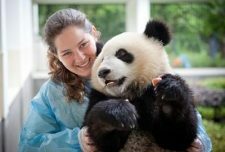 Dujiangyan Panda Base allows a limited number of people per day to join the volunteer program, We recommend booking at least one week in advance and pay in advance to guarantee it. 2. Giant panda volunteer program is not available during the Chinese New Year (Usually from Late Jan to Mid Feb). 11:00AM-11:30AM Feed the pandas with “cake” and fruits at close range; learn about panda’s food habits. 13:00PM-14:00PM Watch a documentary which shows you scientific facts about pandas. Know how people protect them, and how we live together harmoniously with them. 14:30PM-14:45PM Making panda cake and and enjoy the fun of being a chef for Panda. 14:45PM-15:00PM Get your panda keeper certificate and end up! 2. Panda donation certificate and panda souvenirs. 3. English speaking staff in the Panda Base. 1. The panda hugging needs health certificate, IntoChinaTravel will prepare and issue the health certificate to you. 2. Dujiangyan Panda Base allows a limited number of people per day to take a photo next to a panda. We recommend booking at least one week in advance and pay in advance to guarantee it. 3. The panda holding last for 20 seconds, the staff in Dujiangyan Panda Base will help take photos and videos for you, just get your camera ready before hugging. 4. Giant panda holding is not available during the Chinese New Year (Usually from Late Jan to Mid Feb). 5. The Panda Hugging program fee in USD may change slightly according to the exchange rate. Your driver and English speaking guide will pick you up at your hotel at downtown Chengdu at around 7:30am. Then drive to Dujiangyan Base of China Conservation and Research Center, It is 60 km and 1 hour drive. When arrives at the Dujiangyan Base, you will join Dujiangyan Panda Keeper Program or Panda Hugging Program or both. Please let us know which program you prefer and we will make reservation for you in advance. Hotel pick up and drop off from hotel in downtown Chengdu. 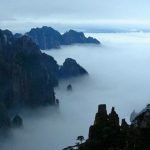 Round way transfers between Chengdu downtown hotel and Dujiangyan Panda base. Pay cash when pick up from hotel. Hello. Do you have this program available for two people April 5 or 6? Hi Christina, yes, this program is available on both 5 and 6 April, our trip consultant will contact you about it.